This idyllic rural retreat at the heart of the Peak District National Park is a detached 17c stone barn, combining stylish modern comforts with oak beams - the perfect mix of old and new. With French windows and a high beamed ceiling, the barn is open plan and all on one level and offers everything you need for a relaxing short break or longer holiday. 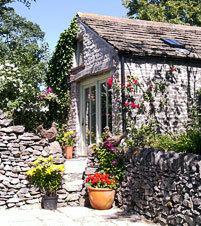 In the summer you can sit out on your own private patio and enjoy the peace and tranquillity. Set in Chelmorton conservation village in the 'White Peak', there are wonderful walks all around and traffic-free cycling along the spectacular Tissington and Monsal Trails. The picturesque dales of the rivers Wye, Lathkill, Dove and Derwent are all within easy reach as are the historic market towns of Bakewell, Buxton and Ashbourne and stately homes such as Chatsworth and Haddon Hall. 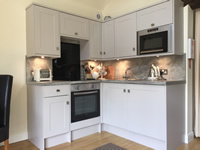 Swallow Barn is completely self contained and everything you would expect from a quality 4-star holiday cottage is provided. 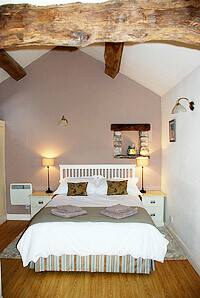 From the comfortable lounge/kitchen/diner an archway leads into the bedroom, with double bed and en-suite shower room. Secure bicycle storage and tap available. As Swallow Barn is open plan and all on one level inside it may be suitable for you if you have limited mobility. There is a gravel pathway (with a very gradual slope), with three steps leading up to the barn, and a small step through the patio doors to enter the property. Once inside there are no further steps. Further Information is available on our Access Statement.